Los Angeles and the bicycle have a love/hate relationship. With gorgeous weather and tons of space, the city is perfect for riding. On the other hand, riding a bicycle in L.A. means traffic, sporadic bike lanes and aggressive drivers who don’t respect cyclists. That’s why all of these rides take place on roads that are entirely car-free or have light traffic. They’ll also work for folks of all fitness levels. They are listed, roughly, in ascending order of difficulty, from a pleasant summer evening spin to a sweaty mountainous excursion. And we’ve included Google Maps hyperlinks to all the routes. Happy pedaling! Let’s start out with the one you probably don’t know about. In the San Gabriel Mountains above Azusa is the gorgeous 7.5-mile Devils Canyon Dam Truck Trail. This gentle climbing from Highway 39 to the Cogswell Dam is one of the most beautiful rides in all of Southern California. The road itself parallels a small but always audible creek, fed by the upriver dam. 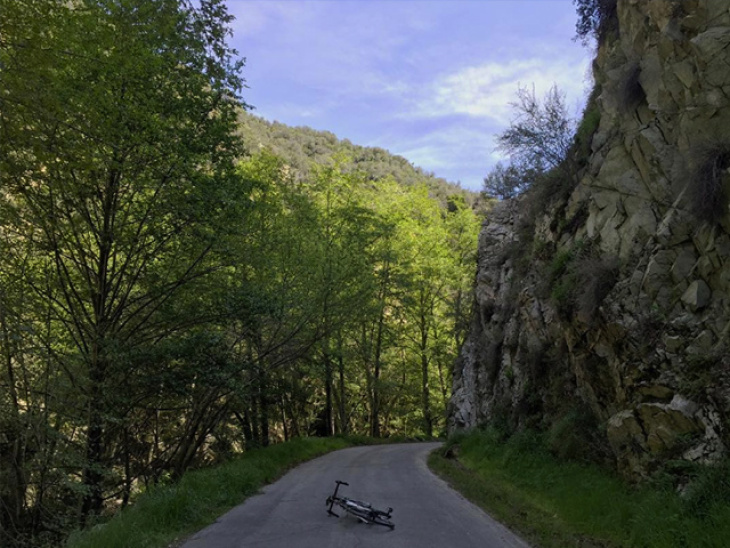 Often shaded by trees and mountains, the road offers riders a cool, relaxed ride. No cell service here. It’s just you, your bike, a bubbling brook and the San Gabriel Mountains. Picnic tables are plentiful along the road, so you can stop and nosh or take it all in. Remember that you’re in the Angeles National Forest, and any trash you bring in, you’ll have to pack out. As for the difficulty, the between Highway 39 and the dam has a gentle slope. You probably won’t even notice the grade until you turn around and realize you’re going faster. If you want to go up to the dam itself, there’s a short, steep grade at the end of the road but the first 7 miles of the road are the main attraction. This is an easy, low intensity ride so bring the kids. Aside from its haunting beauty, the road is closed to all public vehicular traffic. You might pass a car or truck driven by a public works employee but they’re courteous and know to look out for cyclists and hikers. Pedestrian traffic, especially on weekends, can be high for the first mile or so. Once you get past the main recreation and fishing areas, it’s like you’re alone in the forest. Directions: You’re going into the mountains for this one, so you’ll need a car is. Exit the 210 freeway (in Azusa) at Azusa Avenue/Highway 39. Orient your car north (towards the mountains) and keep driving. The road you’re looking for will be 20ish minutes from the freeway, just past the junction of Highway 39 and East Fork Road (you’ll see a bridge). Here’s a Google Maps linkwith the precise location of the dam road. You can park on the side of the road, or in a parking lot a quarter of a mile back off Highway 39. Running from Culver City to Playa Del Rey, the Ballona Creek path lets Angelenos ride 7.4 car-free miles straight to the beach. The path picks up close to the intersection of Jefferson and National boulevards, where it’s bumpy and in poor condition for the first mile or so. Your best bet is to get on the path at Duquesne Avenue in Culver City, and head for the beach. If you’re going in the afternoon, you’ll likely have to deal with a light headwind while heading west. On the bright side, this will turn into a great tailwind on your way back. You’ll find drinking fountains along the pathway, in adjacent parks and parklets. For extra credit, stop at the Baldwin Hills Stairs and Scenic Overlook, at the intersection of Hetzler Road and Jefferson Boulevard. It’s a great outdoor park without the pretension of someother hiking areas in L.A. There are plenty of bike racks at the bottom of the stairs, but if you’re feeling particularly daring, try riding up to the top on Hetzler. Directions: Parking is plentiful along Duquesne Avenue and in the neighborhood near the start of the path. If you fancy yourself more a car-free type, the Expo Line also runs nearby. From the La Cienega Station, ride southwest along Jefferson (which has a good bike lane, just watch out for doors) until it intersects with Duquesne, at which point you’ll turn right. Alternatively, the La Cienega Station is close to the start of the Ballona Path, so you don’t need to ride on Jefferson at all, if you don’t want to. There are also entry points at most major streets (and some residential ones) that the path crosses on its way to the beach. Play with the maps to see what works best for you. 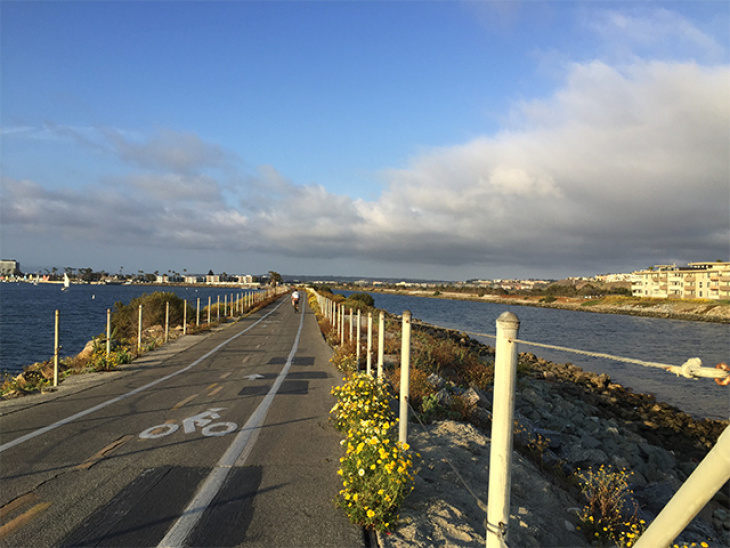 Riding your bicycle along the Pacific coast is paradise, especially the 22 miles of the Marvin Braude Coastal Bike Trail. Stretching between Will Rogers State Beach in Pacific Palisades and Torrance Beach, the trail connects to the Ballona Creek Path, so you can ride all the way from Culver City to Palos Verdes, if you have the time and the stamina. If you’re an avid rider, you probably know about this path, but we’re plugging it here anyway because it’s that great. 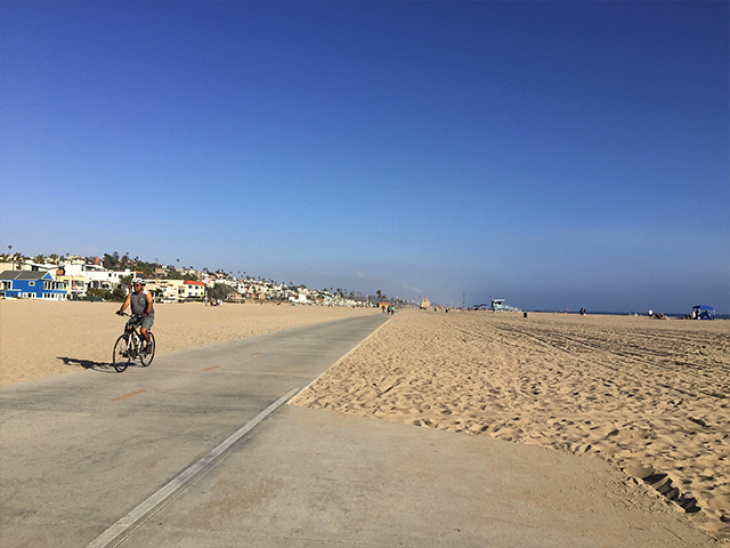 Riding conditions are usually mellow but the path can get crowded and sandy, especially on weekends and on the portions that run through Santa Monica and Venice. Weekday evenings during the summer are perfect. There are lots of facilities at regular intervals along this path. L.A. County even provides a helpful map. On the coast, the path is interrupted twice — once in Marina del Rey, where the path circumnavigates the marina and you’ll ride in a bike lane along Washington Boulevard for a bit, and again in Hermosa Beach, where you have the choice of riding along The Strand (often crowded on weekends) or Hermosa Avenue (very chill). Directions: This is an extraordinarily accessible path and you avoid the exorbitant waterfront parking fees. Find a residential area near the coast, park your car and ride to the path. The Expo Line also runs to the coast. While it’s not particularly scenic, you’ll be in good company while riding at the Rose Bowl. The Rose Bowl Loop consists of a 3-mile loop around the stadium, its parking lots and a golf course. Cyclists and joggers alike use the loop for basic training. While not as adventurous as some other rides, this is a great place to get in shape. The loop is gently sloped, giving you a chance to practice going uphill and downhill. Traffic is light and respectful, given that there are lots of other bikers and runners in the vicinity. Since you’re on a bike, etiquette dictates that you remain to the left of the marked barriers that distinguish space for walkers and runners, and the street itself. There are also drinking fountains and bathrooms closer to the stadium. Unless there’s an event, there’s never a bad time to ride at the Rose Bowl. Even at night, there are lots of people around and the roadways are mostly well lit. If you’re riding at night, make sure to have working front and rear lights. Directions: Drive to the Rose Bowl as you normally would and park anywhere. Parking is free when there isn’t an event going on. 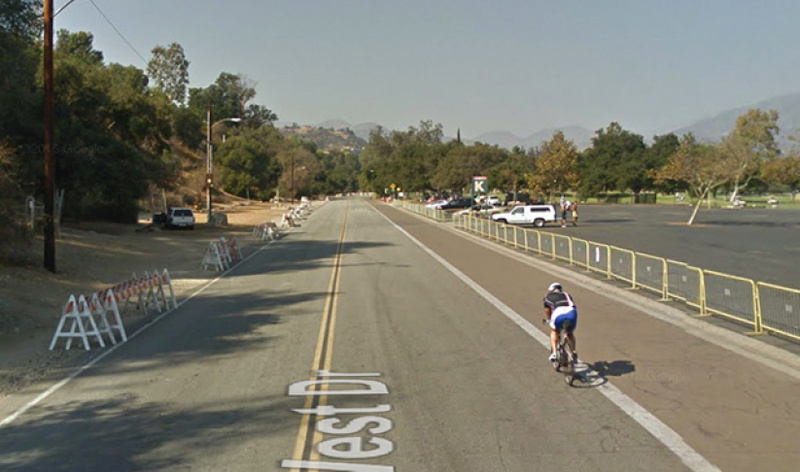 A dirt lot near 176 West Drive, Pasadena is an ideal spot to park if you’re riding around the stadium. If you want to ride far without much hassle (or good scenery, for that matter), you have a number of different river paths. 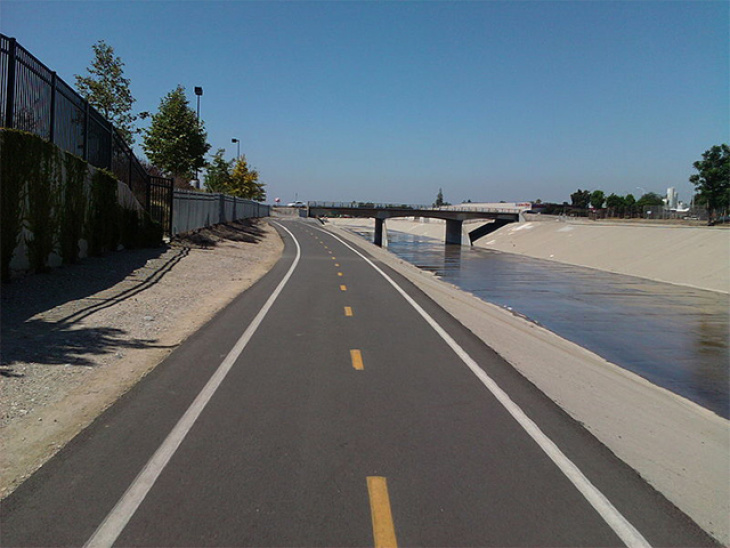 The L.A. River Path, San Gabriel River Path and Rio Hondo Bike Path offer the same thing — long stretches of flat “Class 1” bike path. These lengthy routes, which pass great swaths of Los Angeles, are kind of like freeways for bikes. A bit closer to L.A., a 7.2-mile stretch of the L.A. River Bike Path running between Griffith Park and Elysian Park is great for riding. The Arroyo Seco Pathway, passing through northeast Los Angeles, is another good, albeit short, option at less than 3 miles long. Directions: It’s open ended here, since you have tons of options. Study the maps, figure out where you’re able to get on to the paths, and just go! Arguably the best urban park anywhere, Griffith Park offers you all sorts of options for different styles of riding. If you want a relaxed easy spin, ride along Crystal Springs Drive and Zoo Drive. 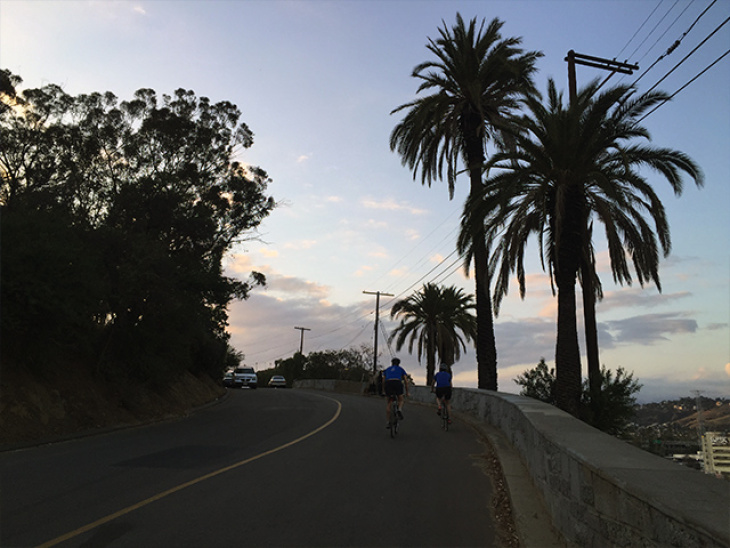 If you want a little climb, complete the loop by adding in Griffith Park Drive. These two routes are easy, well paved and have sizable lanes or shoulder areas to ride on. Traffic is rarely a problem, but the park gets busy on weekends. If you want a workout, Griffith Park has lots of hills, most notably Mount Hollywood, which is crisscrossed with a multitude of ridable roads that let you elevate your body and your heart rate. We recommend circling through the park by climbing up Commonwealth Avenue to the Griffith Park helipad, over Mount Hollywood, and back down to Vermont Canyon. This route has two climbs, punctuated by some flats and descents. Be sure to visit the Observatory while you’re tooling around. Directions: You should already know where Griffith Park is. Parking is free throughout the park and often permissible on the side of the road. Park close to where you want to ride and start pedaling. You could also always ride to the park. Despite being 10 minutes away from downtown L.A., this park flies under the radar and is often sparsely filled. Even on weekends, it’s easy to find a quiet spot in the park. The roads were repaved a few years ago, so you’re riding on smooth, grippy asphalt. L.A.’s oldest park, it offers a cornucopia of transplanted tree species mixed with excellent vistas of downtown, but it’s not the best place to go if you haven’t been on a bicycle in years. Elysian Park is a hilly environment. None of the hills are particularly large or steep but you’ll definitely be climbing. 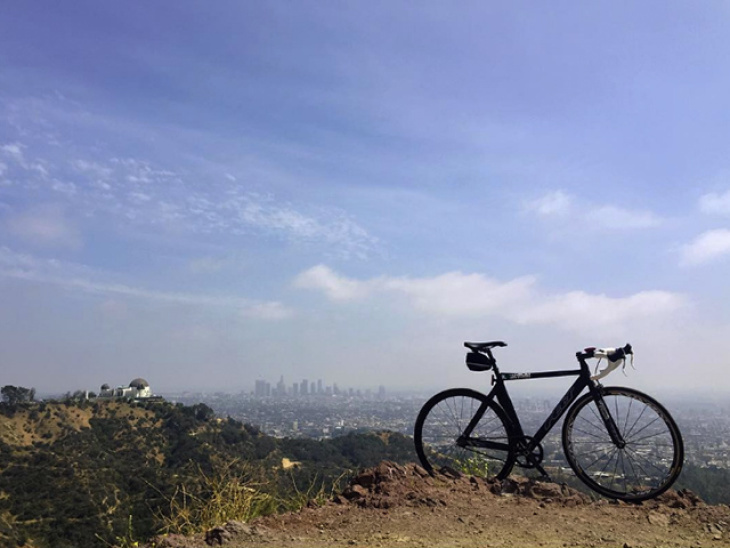 Although cycling and hiking aren’t the same thing, a ride in Elysian Park requries roughly the amount of effort you’d need for the Wisdom Tree Hike to the top of Mount Hollywood, or even to the Hollywood Sign (to which you can also ride your bike!). If you’re new to climbing on a bicycle, the most efficient way to do it is to use an easy gear and spin quickly. Your legs will probably feel like they’re burning, but that means you’re doing it right. None of the hills in Elysian Park will take long to climb and you’ll be treated to fun downhills. Drinking fountains and bathrooms can be found throughout the park. Directions: You’re allowed to park anywhere within the park’s boundaries but check to make sure there isn’t a Dodger game. Traffic is impossible when there is. We had to include this one. If you’ve been riding a lot and you’re bored of Elysian Park, Griffith Park and the beach, explore the San Gabriel Mountains. 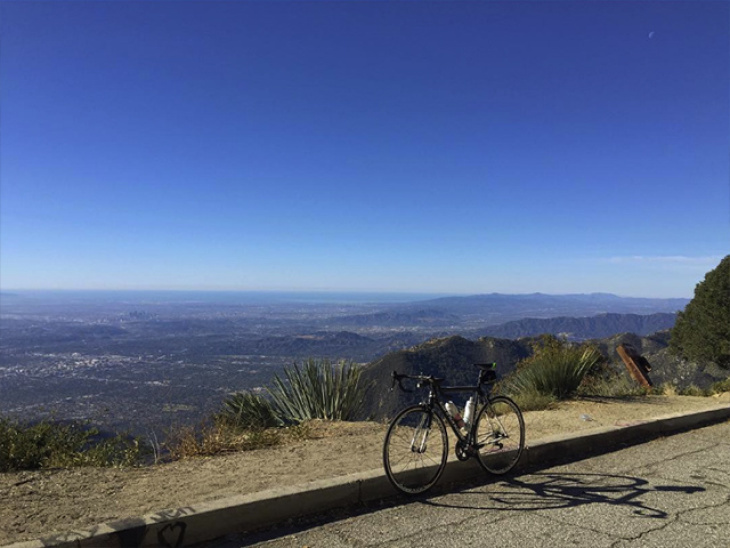 Riding to the top of Mount Wilson is a great introduction to the vast Angeles National Forest. It’s about 19 miles and 4,500 feet of climbing from the foot of Angeles Crest Highway to the top of Mount Wilson. It’s a challenging climb by any metric. You’re looking at roughly two to three hours of riding from the base of Angeles Crest Highway (at Foothill Boulevard in La Cañada-Flintridge) to the top of Mount Wilson. You can find water at the ranger station at Clear Creek Junction (the first junction after heading into the hills) and again at the turnoff for Mount Wilson Road (the second junction). The payoff is a fantastic view of the greater Los Angeles area. Afterward, indulge at the Cosmic Cafe at the Mt. Wilson Observatory. Traffic is usually light although it gets heavier on weekends. Weekend mornings and evenings are great, as well as midday on weekdays. Make sure to avoid rush hour as Angeles Crest is used by fast-driving Palmdale commuters who don’t want to sit on the 14 freeway. Directions: Again, directions are open ended. There’s plenty of unrestricted residential parking close to the beginning of the route. The Gold Line also passes relatively close to Angeles Crest Highway. It takes roughly 30 minutes to ride from the Memorial Park station to the foot of Angeles Crest.